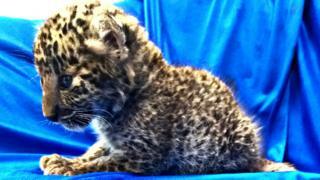 An air passenger who arrived in India from Thailand has been detained at the airport after customs officers found a month-old leopard cub in his luggage. Suspicions were raised when officials heard noises coming from his bag, which was found to contain the 2.2lb (1kg) cub hidden in a plastic grocery basket. The man had arrived at Chennai airport on Saturday on a flight from Bangkok. Authorities are investigating whether the suspect is part of an international smuggling ring, officials told AFP. Image caption Airport officials said the cub looked "weak"
Footage captured at the airport showed officials bottle-feeding the leopard cub milk. Following an assessment by veterinarians, the tiny cat was later taken to the Arignar Anna Zoological Park in Chennai, where it will be cared for, India's NDTV reported. Has Instagram exposed everyday racism in India?